Occupational accidents have a massive personal and social cost as well as a major financial cost. The construction industry is one of the most dangerous industries, accounting for around 20–30% of all occupational deaths worldwide. The accompanying financial cost is either absorbed directly or passed on in the form of higher insurance costs. In addition, regulatory bodies have started to impose legal accountability on all the parties along the construction supply chain. OHS is hard to implement. Construction projects are complex, with a fluid workforce, and the regulatory framework is highly elaborate. 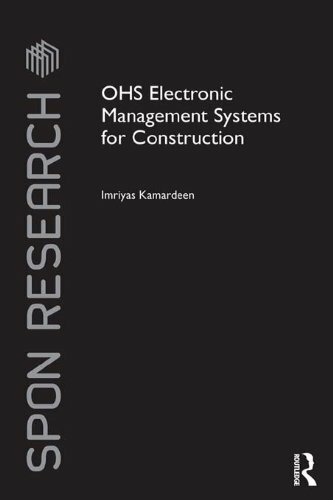 OHS Electronic Management Systems for Construction presents a theoretical framework which is designed to overcome these difficulties, integrating OHS management in construction using knowledge management and web technologies. This framework is explained in a clear step-by-step way, as are features such as a systematically developed corporate safety memory, and a virtual learning portal to facilitate on-demand safety training.